Book – Fiction. By Evangeline Parsons Yazzie. Illustrated by Irving Toddy. 2005. 32 pages. 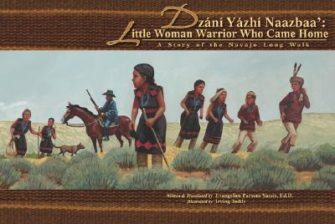 Historical fiction for upper elementary about the Navajo Long Walk (forced removal by U.S. soldiers) of 1863-1864. ISBN: 9781893354555 | Published by Salina Bookshelf.